An interesting mineral, usually polished or carved into decorative objects. 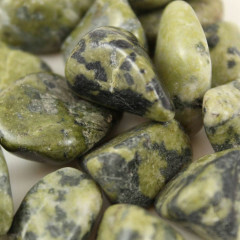 It is usually a pale green colour, and is sometimes mis-sold as Jade. The name actually refers to a group of minerals, rather than a single mineral or gemstone. The three main types are Chrysotile, Antigorite, and Lizardite. One of the important properties of the mineral is its heat resistance – some of the fibrous varieties have been used to make Asbestos. It is used for decorative carvings, gemstones, and polished stones quite often, as it does look great when polished. It is a reasonably soft stone, measuring between 3 and 6 on the mohs scale, so it may be suitable for cabochons and pendants, but is not ideal for use in rings, etc. It is aligned with the heart Chakra. It is thought to help with menstrual issues, including pain and cramps. Ancient lore suggests that some people believed the stone could protect against poisons and venom, including snake bites – some people thought that placing a liquid containing poison into a goblet made of the stone, it would either neutralise the poison or break the goblet. We don’t recommend trying it, though.